Each order contains one pair of socks. Both socks will be printed with your design on the side that faces outward. The inside face will be left blank. Your design will naturally stretch with the socks when worn. We suggest big, bold, blocky designs and text for better legibility and overall maximum design awesomeness. These sporty socks from Hanes are perfect for everyday use. They are great for most kids boy or girl, but they are specifically labeled as Boys Crew socks in size Large, for shoe sizes 3 - 9. We recommend hand washing these socks. 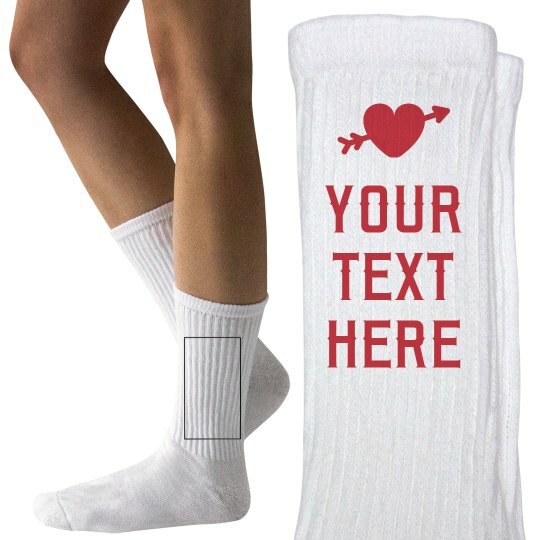 Let your kids celebrate Valentine's with you through these customizeable cutie socks! If you have that funny phrase in mind, then you can place it here, too! It's cool to be basically be fashionable and "in" this Valentine's!